I’m not sure at what point in my childhood that I decided Westerns were not for me. Perhaps it was somewhere between my taped-off-of-local-TV VHS copy of Back to the Future III and my friend’s mom watching Dr. Quinn: Medicine Woman when I was over, but one can only be so sure of such obscure childhood details. What I do know is when I decided that Westers were amazing. Clint Eastwood had always represented the genre I didn’t understand and didn’t care for. When I saw him in Million Dollar Baby I thought, “wow this guy is good” and “why haven’t I seen more of him?” I set out on a mission to find Eastwood. Naturally, I have a slew of film buff friends to bother, so I sought out Ed who has a particularly sensitive sweet tooth for Westerns. I was given the Über Deluxe Magnifico Director’s Cut Limited Collectors Edition (case pictured above) which I think contained some of Sergio Leone’s blood or something as well. With all the begrudging hope of a gold panning 49er, I jumped feet first into the saucy spaghetti western world. Beautiful. 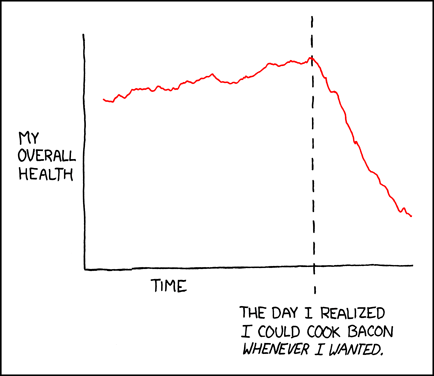 No one quite says it like xkcd. Now I can continue on knowing that you understand the true weight of my revelation. Yes, Westerns had arrived, in the brain of Steve at least, and life was good. Next I watched Jeremiah Johnson , Unforgiven, and Once Upon a Time in the West. JJ was a suggestion from my father-in-law, and not technically a western per se, but certainly in a similar vein. Robert Redford plays a loner mountain man who catches bears and drifts, not my favorite movie, but an entertaining and manly frontier piece for sure. Given my new Westernophile status, when I saw the preview for James Mangold’s 3:10 to Yuma starring Ben Foster, Russell Crow, Christian Bale, and the great Peter Fonda, I simply could not refuse. I called up my movie fanatic cousin Kiel and said, we’re going to see this right now. It did not disappoint. I won’t ruin any of it for you, but let’s just say that Foster was sorely overlooked for Academy recognition in 2007 for his role as the insane villain, Charlie Prince. I highly, highly suggest that you see this film. And now, we have Ed Harris directing the remake of Appaloosa starring the gruff-voiced Viggo Mortenson, the gruffer-looking Jeremy Irons, and the epiphetless Renée Zellweger. They’re even pulling the androidish Lance Henrikson out of storage for this one (were there flamethrowers in the Old West?). I think movie makers have been prodding the public timidly for the past few years to find what they want in new films. What hasn’t been done in this new generation? Westerns. My hope is that, as I’ve seen the comic book film industry boom, we don’t see a few fantastic Westerb remakes of old classics and then thirty drag-me-behind-the-horse failed attempts hoping to break the bank and beat the Sherrif out of town. That being said, do yourself a favor and go rent a Western. Educational Change in Finland; What Can We Learn?